We have now introduced the concept of a “host” and added hierarchical control to conference calls. In this new behavior, the host can remove participants without requesting them to take any action. When a conference call is created, the longest connected agent becomes the host, unless there is a supervisor present, in which case the supervisor will be the host. The host is then dynamically transferred when participants join and leave the call. For example, when a supervisor host leaves a call, the ownership passes to the next longest present supervisor, or if none are on the call, to the longest present agent. Prior to this release, when agents, supervisors, and other participants were on a conference call, agents and supervisors relied upon the goodwill of participants to drop their connection and leave the call. To remove a participant as a host, while in a conference call in Agent Console, click next to the participant's name and click Confirm. For details, see our content on Conference Calls. Introduces the concept of Host who has control over the removal of participants. Adds a hierarchical control to conference calls. Allows removal of participants without requesting them to take action. Brings control to the session instead of relying on the participants to drop their connection and leave the call. A conference call is defined as three or more parties on a call. A call with two parties is not considered a conference call. The longest connected agent is the host, unless there is a supervisor on the call. If there is a supervisor on the call, the longest connected supervisor is the host. Only one active host exists in any conference call. The first supervisor to join the conference becomes the host. if there are other supervisors in the call, supervisor is just a participant that may become the host after previously connected supervisors leave the conference. Participants rejoining an existing conference assume a new connection and do not hold any host rights from earlier in the call. A supervisor that rejoins a call where there is no other supervisor becomes a host. Where a supervisor joins in a whisper or monitoring mode, they do not create a conference by being the third caller nor do they join an existing conference. A call reducing to just two parties, drops the hang-up feature and returns to a normal call. When a conference is created, the host receives a brief message (5 seconds display) that advises them of their new status. Virtual Contact Center users can see the names of other participant. The host is marked and can see the Remove button for all other participants in the list. Join a conference call as a host. A supervisor or the longest connect agent in the call becomes the host. Click to remove a participant from the call, a confirmation message appears. Click Confirm. A removed participant gets a notification of their removal. 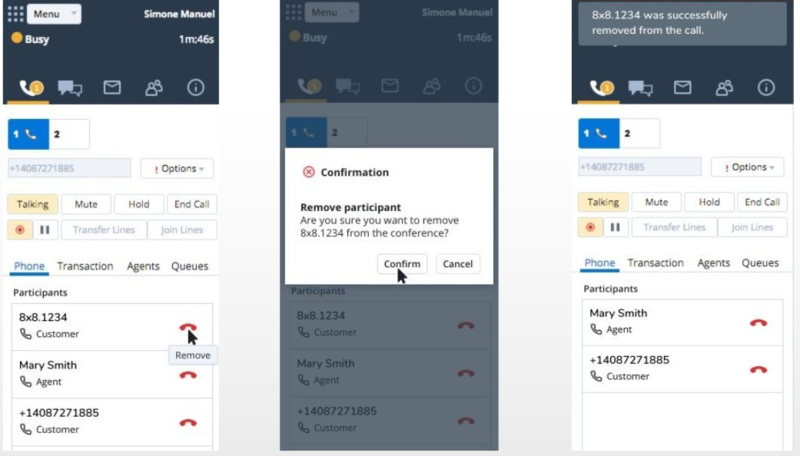 If the host changes during a conference call, the old and new hosts receive a confirmation of their change of status and the Remove button only shows up for the new host. - The new participants joining the call appear at the top of the list. - The host is informed if a participant leaves a call on their own. 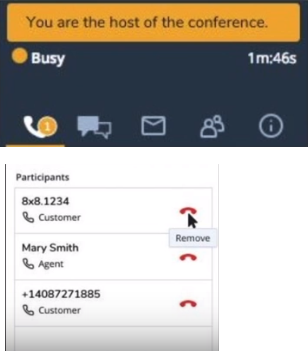 Click End Call to disconnect from the conference. If the host leaves the call, other parties remain connected to the conference call and the ownership passes to the longest present supervisor. If there is no other supervisor, the longest present agent will be the new host. If the call reduces to just two parties, it drops the conference feature and returns to a normal call.